When we moved into the house, sometimes we forgo decorating the kitchen and dining area and settle for the basic necessities. A simple way to liven up the kitchen is to create a tasteful number of focal points. The thing with creating focal points is that it’s easy to get carried away and create a visually messy design. Looks like Reese Witherspoon’s kitchen in Home Again movie. A backsplash protects your walls from food and drinks splatters but it doesn’t mean it should be left grey and boring. Decorate it with tiles to form beautiful patterns and watch it level up your cooking area. By using an accent countertop, you don’t need to debate with the designer whether it should be black or white marble. It is also in trend at the moment. Put a different spin on it by going for a wooden countertop. You don’t need to redo the whole kitchen to add in pops of colour. Having small furniture such as bar stools in red works well because it’s striking and can be swapped or repainted when you get bored of it. Unfortunately, the beautiful KitchenAid Artisan stand mixers cost a bomb but there are other affordable colourful appliances in stores. Get a vibrant coloured fridge or hang up colourful pots and pans on a wooden frame like an art piece. 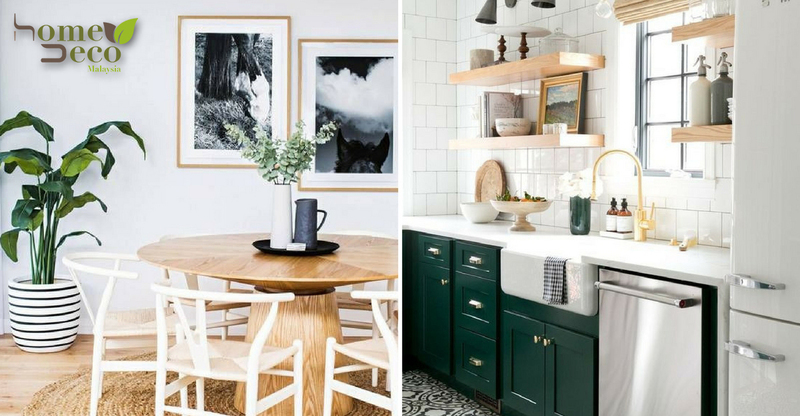 If you’re not going for an eclectic kitchen, try to keep everything else neutral while only highlighting a few. Another quick way to draw attention is to repaint the cabinets. Experiment by painting your favourite colours. Textured walls are great for those who are not keen on a colourful kitchen. A 3-D textured wall keeps the minimalist kitchen from being monotonous. If you are blessed with a stunning view from the kitchen windows, use it! Ditch the upper cabinets and install longer and wider glass windows to showcase the view. A full-height pantry on an interior wall can provide the needed storage. Good lighting makes a lot of difference. Have fun in choosing decorative hanging lampshades that can enhance the room especially in minimalist spaces. Usually, most will try to avoid putting up artwork in the kitchen in fear of getting it damaged by grease and humidity. However, there is a way around this. Instead of putting up framed pictures, why not invest in a nice acid glass or display sculpture? If there are already mini artists in the house, arrange their masterpieces in a pleasing way. Time to be an art curator of the house! Other than displaying their drawings, you can throw in family photos and postcards into the mix.